This post originally appeared on April 12, 2019, in “Eat, Drink, Watch” — the weekly newsletter for people who want to order takeout and watch TV. Browse the archives and subscribe now. Tracy Morgan is such a charismatic comedian, I swear I could watch him read the telephone book in half hour installments each week. The TBS show The Last O.G. continues to be the perfect platform for Morgan’s brash, absurd, mostly sweet-but-occasionally-raunchy comedic persona. And in the latest episode, his ex-convict character, Tray, hatches a culinary dream that will presumably become a big part of the second season of the show. Food has fueled The Last O.G. since the first scene of the pilot, where Tray is shown making fried chicken for his girlfriend, Shay (played by Tiffany Haddish), on the fateful night when he commits a crime that lands him in jail. After finishing his 15 years in a state penitentiary and moving into a halfway house, Tray tries, unsuccessfully, to reenter the workforce at one of the artisanal Brooklyn coffee houses that popped up while he was in the slammer. And in the second episode of Season 2, “Git Up Git Out & Git Something,” Tray takes a job working in the cafeteria of his kids’ bougie middle school. As we learn at the start of the episode, Tray perfected the art of taking random scraps and turning them into delicious creations while in jail. In a flashback, we see him somehow transform a few pieces of Spam and some leftover potato salad into a chicken wing. Intent on putting his culinary skills to good use, Tray meets with the middle school principal — played by Morgan’s former 30 Rock co-star Jack McBrayer — and convinces him to give him a job in the school’s extra-healthy cafeteria. During his first day on the job, Tray starts offering snacks like his “C block macaroni and cheese” and “chocolate M & M and cocoa puff muffins” as off-the-menu treats to his kids and their friends. When one of the tweens gets hooked on these sweets and tries to score an extra stash, Tray’s secret side hustle gets exposed, and he loses the job. The episode ends with Tray realizing that he wants to go into business for himself as a food truck operator. He doesn’t have the cash or the credit to buy one, but thankfully, his acquaintance Mullins (Cedric the Entertainer) just came into possession of a mysterious, banged-up food truck, that he gifts to Tray. Now, it seems, the Last O.G. is once again on the path to culinary glory. The Last O.G. airs Tuesday nights at 9 p.m. on TBS, and you can find episodes on Amazon Prime, iTunes, Google Play, and YouTube. The gist: Like the latest episode of The Last O.G., the season premiere of Lena Waithe’s Showtime series also has a food truck fantasy. After parting ways with a trendy restaurant and deciding to strike out on his own, we now see chef-on-the-rise Brandon (Jason Mitchell) running his own “soul food taco” truck. Sadly, it doesn’t take long for his dreams of operating a mobile restaurant to get dashed. 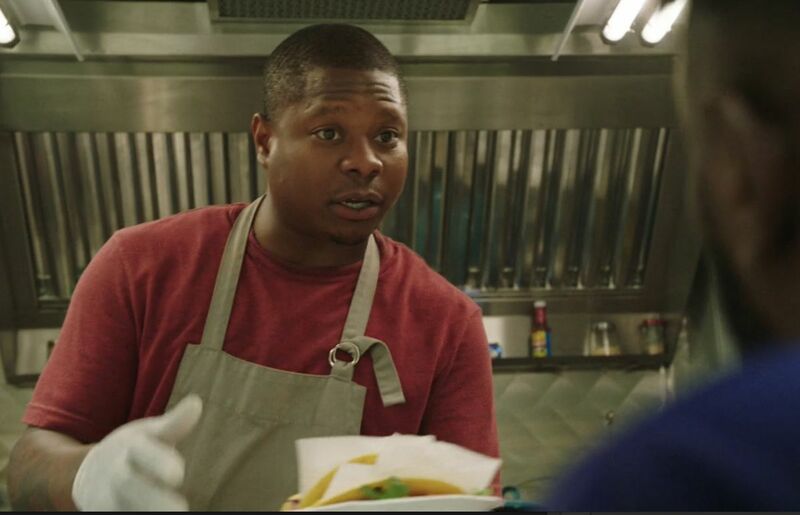 But the montage that starts this episode, depicting Brandon serving tacos all over Chicago, is one of my favorite scenes of any TV show so far this year. There’s also a suggestion at the end of this episode that Brandon will focus on telling his life story through food this season. The food truck plot is just one of around five major storylines in this acclaimed series. Thankfully, though, the action is much easier to follow than many similarly sprawling TV dramas, so don’t be afraid to dive into Season 2 if you missed out on The Chi the first time around. A word of warning, though: The last five minutes of “Every Day I’m Hustlin’” contain a truly disturbing scene involving violence toward an elderly woman. The gist: Earlier this week, South Carolina-born comedian Stephen Colbert got into an amusing argument with North Carolina-born comedian Zach Galifianakis about their home states’ respective barbecue styles. “I love everything about North Carolina other than that damn vinegar stuff that y’all put on the barbecue,” Colbert remarked. “[It’s] perfectly fine, dry-rub, smoked barbecue, and then you just come all over here and [expletive] all over it with that vinegar.” Instead of dragging the mustard-heavy barbecue of South Carolina, Galifiankis takes a more diplomatic approach, telling Colbert, “We’re vinegar-based, and we can be different Stephen — we don’t have to build a wall between us.” The whole segment if amusing, but if you want to catch the barbecue stuff, skip ahead to the 4:00 mark. The trailer and lineup for Street Food, the new culinary docuseries from the Chef’s Table team, both look incredible. It lands on Netflix on April 26. A message to America’s favorite sports mascot, Gritty: Now is your chance to glow up. The Queer Eye team is casting in the Philadelphia area for an upcoming season. And speaking of Queer Eye, fans of the show have raised $90,000 to send 23-year-old Jess Guilbeaux, star of the episode “Black Girl Magic,” back to college. The Internet has a major crush on the new, fake Colonel. Last Friday, the Late Show imagined what a seafood restaurant run by Attorney General William Barr might look like. Disney’s forthcoming streaming service will eventually be home to a cooking competition show called Be Our Chef hosted by The Office’s Angela Kinsey. SNL’s Heidi Gardner has a great coffee hack and a truly bold croissant opinion. Fixer Upper duo Chip and Joanna Gaines are taking over the DIY network next summer and filling the channel with yet-to-be-announced lifestyle programming. And finally, the latest TV chef to venture into the world of dog food manufacturing is…. drumroll please… the Pioneer Woman. Have a great weekend, and if you’re looking for something vaguely spring like to make, consider putting together a sorrel pesto rice bowl in the style of Sqirl using this recipe.